On Christmas morning, wouldn’t it be nice to wake up to a healthy, Weight Watchers breakfast that was cooked for you, hot and ready? 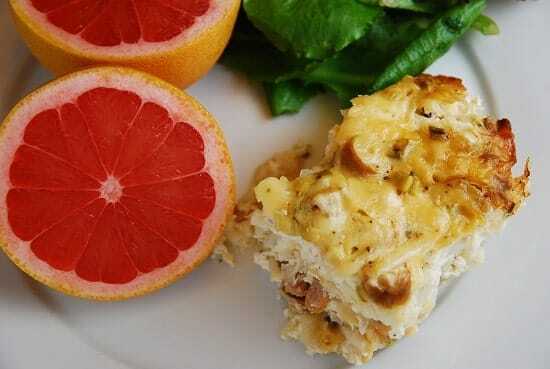 Well, this easy Crock Pot Breakfast Casserole Recipe does just that! Full of protein, but lower on carbs, this breakfast casserole packs in everything you need for a filling and satisfying meal. Just prep it and put it on the crock pot the night before, and it’ll be ready when you wake up! I topped mine with some reduced fat sour cream and salsa for extra oomph. I’ve also made this dish with turkey bacon instead of sausage, and that works really well too. And each serving is just 6 Points, which isn’t bad for a delicious casserole filed with sausage and cheese. This breakfast casserole recipe is perfect for the non-morning person who still wants to put together a healthy and tasty breakfast for the family. Enjoy! What size crockpot/slowcooker is best for this recipe? Cooked this overnight last night; very tasty! Family likes it a bunch, and I’ll definitely be making it again. Thanks for sharing such a great recipe! Firstly, it’s listed as 6 servings, at roughly one cup each. My results are at LEAST 9 cups of casserole … maybe 10. I tweaked a few amounts a tiny bit — slightly more sausage, slightly fewer hash browns — but maybe a half-cup worth of adjustment, total. Don’t know that this is a problem … I was just surprised. Secondly, we loved it, but mine came out very slightly watery … mushrooms and peppers both release a lot of liquid when they cook, and I presume that’s the cause. Ought I have sauteed them first? Would that have been likely to help? Or should I have let it cook longer, perhaps? Anyway, thanks again. Love your website; we live with my husband’s mom, and she’s just started WW again — this site is a terrific resource! I’m sooo disappointed! This is the second recipe I’ve tried from here and both were just inedible. Not even my dogs would touch this. Such a waste of food. Can I substitute the egg whites for egg beaters? If so, how many? What size of package did you use for the hashbrowns? Was wondering anylick with storing fridge reheated or even freezed? Quick question- is it really 14 egg whites? It is! When you are just using the white of the egg, it’s a lot less volume than if you were using the whole egg. I would guess yes…it serves 6 people…that’s just a little over 2 whites a person. really wish a Merry Christmas for you and your family.